Victor Quinn is writing on the Svbtle network. I have been using Opera Next 18.0 as my primary browser for the past few weeks. 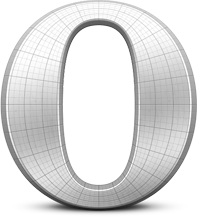 This is the first version of Opera with the guts of Chromium. I should mention, for the unfamiliar, Opera Next is essentially the Beta version of the Opera browser. It is pre-release software and thus not fully complete yet. Chrome has a similar beta build called Canary. One of my motivators for trying it out is that under the hood Opera Next is now using Blink, the rendering engine Google forked from Webkit. I’ve used Opera as my main browser in the past, but usually ended up moving back to Safari or Chrome because its own Presto rendering engine tended to be a bit quirky. No more. With Blink they’re literally using the same engine as Chrome so those quirks are a thing of the past. It does so by creating a new file with the same filename as the one you were editing, but wrapping it in # characters. So if you were editing mycoolfile.js, after changing 300 characters, you’d have a file named #mycoolfile.js# in that same directory. This can get really annoying when dealing with version control. You can do it on per repository basis, and that works, but only for the specific repo you added it to. [#]*[#] to that file so they are ignored globally by git. I recently joined the ranks of Svbtle with this blog. Thankfully, Svbtle takes care of most things for me, with choices I would have made myself. The one main decision left to me for the look and feel was my Accent Color and I wanted to choose a great, unique one. But somehow I wish they weren’t so tough. With all of my smart and none of my dumb! Want to Work for a Startup? Contribute to Open Source! Our CEO at SocialRadar, @michaelchasen just tweeted an article entitled “Want to work for a startup?” which had 5 great tips for getting hired at a startup. This assumes you want to join a startup on the technical side of course, but few things will get you more noticed and be more impressive to the hiring engineers at a startup than contributing to open source. Whether you are creating a library from scratch or helping on an existing one, contributing to open source shows how you can collaborate, will get your name out there, provides a potential employer with a code sample, and shows you have the motivation to build something outside of work. Seems like it should be easy these days, right? no small task as there are a bunch of gotchas. Hopefully this will help. be compiled into the /target directory as js files. This has the nice fringe benefit as it means this compilation from coffee to js happens just once with each push. Long story short, Alfred 2 and Emacs installed via Homebrew don’t exactly play along nicely. Alfred 2 doesn’t like to follow symlinks so it won’t open Emacs. workflows would allow me to fix this myself before they intervened. Or simply edit my workflow and update it to use the latest path. This is one of those tips that seems almost too easy to be true. My resume and cover letters are written in LaTeX. LaTeX is a typesetting system often used for creating technical documents as it is particularly good at creating complex documents including scientific equations. I have been using it for a few years to draft documents both because it gives me a lot of control over the output and so that I could prepare myself for working with technical documents such as patents which are likely be written in LaTeX. I wanted to include my signature in a cover letter. In order to do so in LaTeX, it required a graphic in .eps format. However, my signature was a .png image. I searched for awhile until I came across the answer which was so simple I felt silly for not knowing it. I used git to connect to my employer’s subversion server. I was using a package called git-svn which includes connectors between the two systems. Upon upgrading to the Mavericks, git svn stopped working. The solution follows. First, install the latest version of Xcode. An interesting note is that in the move from Lion to Mountain Lion, Apple decided to move it from its former home in /Developer/Xcode to /Applications/Xcode. This was the root source of many of the issues as many of the utilities were searching in the wrong place for the appropriate binaries.